Providing your Labrador with a dog bed specifically for them will make them feel special and improve their sleeping conditions. Labradors, unlike the Teacup Maltese breed, grow in size as they get older. Once reaching their potential size that small dog bed won’t suit them anymore. Before purchasing your dog bed you should think about what requirements you’re looking at. Some of the most common requirements are: Durability, size, and hygiene. I personally would love for any dog bed I get to be easy to clean. I’d also prefer for it to be just as big, or a little bigger than the size needed to provide my dog a comfortable slumber (these won’t all be convenient enough to be considered a sleeping bag). These things and more could be found in the 4 top “best dog beds for labs”. If one of the above caught your interest, you may get more details below along with where they may be bought. 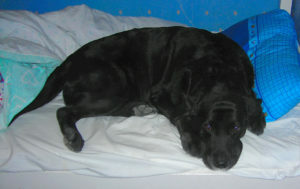 Laifug Dog Bed – For a lab the large size would be highly recommended (however situations may vary). For about $62-80 you can get it with free shipping on Amazon, and you have the liberty of picking from 5 colors! Made with a suede surface it’s also resistant to dust mites and is machine washable for your convenience! Big Barker Headrest Edition – Big Barker is known for their large, comfortable, and exquisite dog beds. Coming with a 10 year guarantee it’s surely worth the bit exaggerated pricing; after all, you’d be purchasing nightly comfort for your dog. It’s easy to clean (can be machine-washed), and has a microfiber cover which provides it with that soft touch. Orthopedic Smokey Dog Bed – This waterproof, extra large (40″x35″x4″) orthopedic dog bed won’t fail to disappoint. As your lab grows older, or encounters issues such as: joint issues, arthritis, and hip dysplasia this will still be the bed for them. A benefit to this is that it’s not specifically for labs, it provides its benefits and fits the needs for most large dog breeds! BigBig Home Bed – If you purchase this for your lab be sure to get the medium size (L30″ x W26″ x H7″) incase it grows more (or if simply the smaller sizes wont do). Working as a bed, or sofa, you’re also able to hand-wash it. Providing a year-round function you can also pick one of 2 colors!